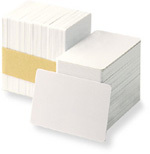 White PVC cards, 30 mil (0.030") thick. CR-80 (credit card) size. Special finish: Matte (unpolished) in one side, polished (glossy) in the other side. Matte side is NON-PRINTABLE. Made to order item: 10 days lead time, minimum order 2 boxes. No returns allowed.